Boston starter Rick Porcello threw a complete game, in which the only hit he allowed was a solo home run by Miguel Andujar in the third inning. The only other baserunner the Yankees had all night was Brett Gardner, the first hitter of the game who was hit by a pitch and then was erased by a Giancarlo Stanton double play. Boston got three in the first inning, on a Steve Pearce two-run home run, keeping his momentum going after hitting three homers on Thursday night, and an Eduardo Nunez RBI single that he dunked into right field. Oakland jumped out to a 5-0 lead in the bottom of the first against Yankees starter Mike Buddie, with an RBI double from Matt Stairs, and a two-run double from Jason Giambi doing most of the damage. The Yankees got one run back in the third, on a Derek Jeter RBI single. That was all Oakland starter Kenny Rogers would allow until the ninth inning, when the Yankees exploded for nine runs. 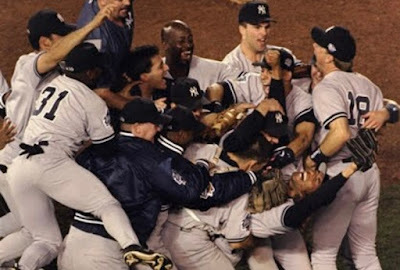 Rogers gave up singles to Tino Martinez and Tim Raines, and he was lifted for Billy Taylor. After Chad Curtis reached an error to load the bases, Darryl Strawberry hit a grand slam to tie it at 5. The Yankees took the lead on a Derek Jeter RBI groundout, followed by a solo home run by Paul O'Neill, a two-run homer for Martinez, and an RBI double for Curtis that made it 10-5. Graeme Lloyd earned his second win of the season (2-0 record) as he threw two scoreless innings, and Mariano Rivera pitched a scoreless ninth, but with the Yankees up 5, did not earn the save. Where they stand: With the loss Friday night, the 2018 Yankees (68-40) are now 12 games off the pace of the 1998 team, which was 80-28 through 108 games.